Antique - Court China by William Lowe, of Longton, England - "Trinity" Pattern - Made from 1912 thru 1920 - Totaling (40) Pieces. 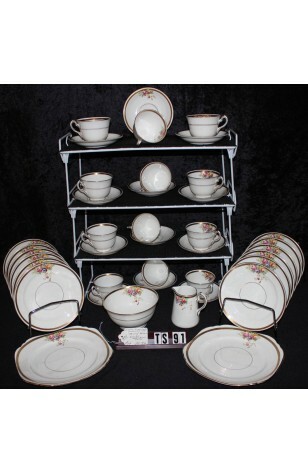 This is a Full Tea Service for (12) Twelve by Court China. Although quite Old, it obviously has been well maintained, and in great overall condition. Produced from 1912 thru 1920 in the Edwardian Period. It is strikingly Beautiful in its Simplicity, and Use of 22kt Gold. The Bright White Background Holds a Bouquet of Red/Orange/Violet Roses, with a Wide 22kt Gold Band on Edge, 22kt Gold Verges, Rims and Feet. Both the Bouquet, and the 22kt Gold, is on the inside of the Cups and Sugar Bowl as well. 12 - Saucers - 5 1/2"
12 - Bread/Dessert/Tea Plates - 6 1/4"